In an interview with US network CBS, President Bashar Al-Assad said a war is not in the US interest as Russia suggests a compromise plan where Syria would hand over its chemical weapons. 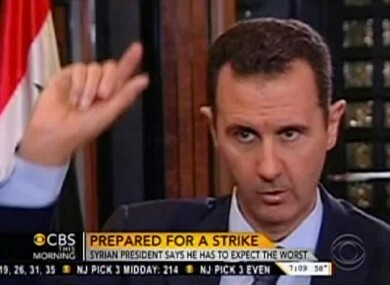 Bashar Assad said that the US should "expect every action" in response to Syria strikes. SYRIAN PRESIDENT BASHAR Al-Assad has told the US Government to produce evidence of a chemical weapons attack in Damascus last month and denied the attack took place. We were disappointed by this administration because we expected that this administration was different from Bush’s. They are adopting the same doctrine with different accessories. So we expect this administration to be strong, not to be weak to say, ‘We don’t have evidence, that we have to adhere to international law, that we have to go back to the security council and the United Nations. The first question they should ask themselves is , what do wars give America? Nothing. No political gain, no economic gain, no good reputation. The United States is at an all-time low, so this war is against the interests of the United States. Why? This war is going to support Al-Qaeda and the same people who kill Americans on 11 September. Assad went on to deny that his troops carried out the the 21 August attack that the US claims killed over 1,400 people including 400 children in a Damascus suburb. The US congress is set to vote this Wednesday on whether to give President Obama the authority to launch military action. Separately, the US said this afternoon that it would take a “hard look” at a Russian plan for Syria to hand over its chemical weapons. Authorities expressed skepticism about the credibility of the initiative however. “We’ll look at this new development, we’ll take a hard look at it,” deputy State Department spokeswoman Marie Harf told reporters. Moscow earlier seized the diplomatic initiative by announcing a plan for Syria to put its chemical weapons under international control, which it said could forestall US air strikes. Ben Rhodes, a US deputy national security advisor, told MSNBC that Washington would not ease pressure on Damascus despite the Russian proposal. “I think we will just have to follow up with them and with other countries going forward to assess the seriousness of this proposal,” Rhodes said. Email “President Assad puts it up to US to produce evidence of chemical attack”. Feedback on “President Assad puts it up to US to produce evidence of chemical attack”.